JCT is committed to respecting your personal information and making sure that if we need to collect your data, you know why, for what purpose, and how you can manage your preferences. In order to provide you with the full range of JCT products and services, we are sometimes required to collect information about you. Some of this data is required in order for us to fulfil a service you have requested of us - for example, delivering a product you have purchased via the JCT online store. Other data may be used where you have specifically opted in to receive information about a certain service, so we use your data to make sure we can reach you accurately and provide you with the relevant information. When you make a purchase via the JCT online store for a product or service, we need to collect data including your name, email address, telephone number, company, delivery address, and billing address. This information is necessary for us to fulfil your order, making sure that it gets to you safely and enables us to contact you if anything goes wrong. By enabling you to register and create a user account, we store this data so that it is easier for you to log in next time and make new or repeat orders, change any of your details and preferences, and download VAT invoices where applicable. We share this data with our fulfilment providers, RIBA 1834 Ltd (for hard copy contract and other hard copy documents), the Met Office (for JCT/Met Office weather products), and Thomson Reuters (for JCT digital service, e.g. JCT On Demand). Your data is only used by our third-party suppliers for the purpose of fulfilling your order, not for any marketing purposes. Where we are acting as agent to a third party organisation we will transfer your personal data for the purposes of the provision of your procured services (e.g. where you have requested to find out more information about Met Office services). We only use the data you provide to set up an online store account for marketing purposes (i.e. to email you about new products and services, or updates) if you specifically opt-in, by ticking the box in the registration form. We do not store, or have access to any login details, passwords, or payment details. Our websites and CRM are fully encrypted with up-to-date security certificates and a separate encryption is enforced at the point you log in. Our checkout process is with SagePay and governed by strict security protocols. The Thomson Reuters checkout process for JCT digital services is likewise bound by security protocols and end-to-end encryption. 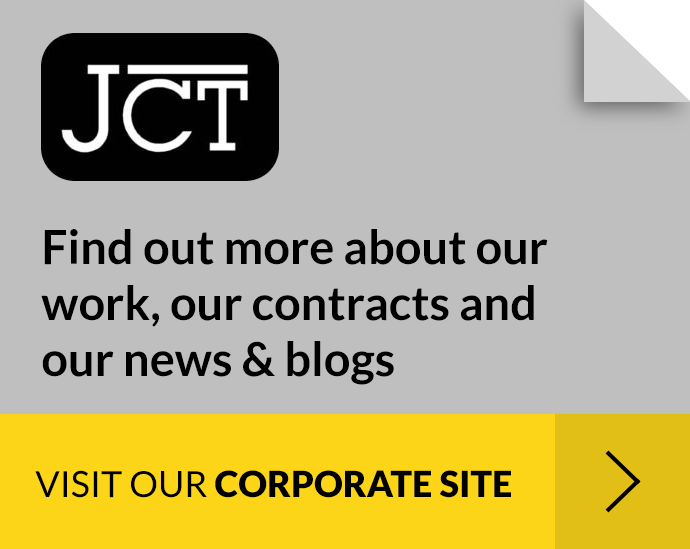 When using the JCT online store or corporate website, you may use a form to contact us, or you may register to receive more information or sign-up to a specific group, such as the JCT Network, JCT Events, JCT Training, etc. We will store the data you submit as part of these processes. Beyond the account registration process data, as detailed in the online store section above, we may also ask you additional information including, but not limited to, the sector or profession you work in, and what JCT product or service you use most, or are most interested in. Mostly, these questions are optional, and we ask for and store this information to make sure that we provide you with the most relevant and accurate information as possible. We may also use the information for internal administration and analysis (such as managing our events or training courses). We will not transfer your personal information to any third parties other than to our agent Switch, who assist us in running this website and related services, and who are subject to security and confidentiality obligations. We never disclose your information to any other third parties. Unsubscribe using the link from an email you receive. This will ensure that you unsubscribe from that specific list. Note, this won’t unsubscribe you from all lists necessarily, only the emails that are from that specific list (e.g. unsubscribing from a JCT Network email will unsubscribe you from the JCT Network, but not the JCT online store marketing list if you are also signed up to that). Log in to your account and access your preference centre. Here you will be able to manage all of your communication preferences, and be able to join, or unsubscribe from any available lists. Note – JCT marketing communications are specific to a particular purpose. We want to make sure we only send you relevant and useful information, so sign-up lists are based on separate topics (JCT Network, Events, Online Store, etc.) rather than a catch-all tick box for items that may not be useful for you. This enables you to have greater customisation over how we communicate with you. All JCT marketing communications are opt-in only. We never use pre-ticked boxes or assume that you want to be on a list. You have the right to request a copy of the information we hold about you, to have any inaccurate information corrected or any part or all of your data deleted and to object to the processing of your information. To do so, please send your request to stanform@jctltd.co.uk. We are committed to provide any requests for data within 30 working days and to amend any corrections within 60 working days. You also have the right to be forgotten – i.e. to have all data and record of you deleted from our databases. We will comply with any right to be forgotten requests; however as a policy we first ask that you consent to us adopting a ‘supress-not-delete’ policy. What we mean by this is if we unsubscribe you from all lists, we still have your data stored, but we know never to contact you. If we delete you from the database, we have no record of you having ever been there, so we are unable to guarantee that we will not inadvertently contact you again. If you still wish to have all of your data removed this will be done within 30 working days, with the understanding that we could contact you by mistake in future.